Take a moment and ask yourself, “Where would we be without glass?” Many of you are reading this through glass; the glass of your computer or tablet screen, or the glass that rests in a frame on your nose. Heck, without glass, there wouldn’t be fiberglass. No fiberglass, no circuit boards. No circuit boards, no computers. In short, you wouldn’t be reading this at all. And take another moment and think about that water that is in that glass made of glass. What makes you think it is safe to drink? In many countries, even today, it might not be. But how did we get to the point that in most of the developed world it is safe to turn a knob and get safe drinking water? At one time, no further back than the Civil War, whole cities of people died each year from drinking water. 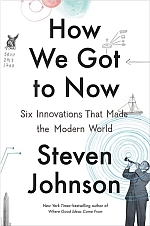 How We Got to Now is an extremely well written, well presented book. It is also a PBS series, but let’s focus on the book. The author, Steven Johnson, and a large host of collaborators I will add, takes a very interesting look at history. Normally we view history as Who, What, and When. Who did what, and when did they do it; the acts and deeds of mighty figures and armies moving imaginary lines and beliefs around the globe. Johnson and crew take a different tack. What if future histories are written by androids, like Commander Data from Star Trek for example? Might those intelligent machines focus more on things, the ‘what’ of history? Beliefs and the imaginary lines of city-states lose their meaning. The focus becomes, “What things changed the world?” And believe me there are a lot of them, and many that have far more lasting effects than any historical figures you could mention. The book is well written. It is accessible even while dealing with complex systems. It is compelling. I often found myself debating if I should get some sleep or couldn’t I read at least one more section. A wonderful work that should be read by everyone. It will change your perspective. This entry was posted in Book Reviews, Weird Science. Bookmark the permalink.